BOHOL PROMOTION IN KOREA. Gov. Edgar Chatto meets with PAL Korea Sales Director Jin Woo Jung (seated left of Gov. Chatto) at Four Seasons Hotel in Seoul to discuss strategic Bohol promotions in the Korean and Asian Market. Filmmakers from Korea will soon visit Bohol in line with promoting the province as a film destination. This was bared by Gov. 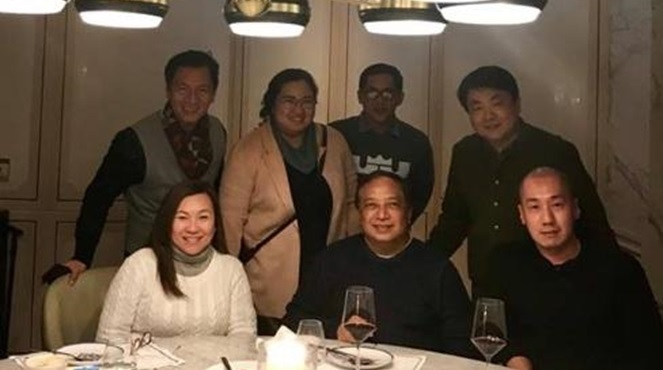 Edgar M. Chatto after a weekend dinner meeting with Philippine Airlines (PAL) Korea Sales Director Jin Woo Jung at the Four Seasons Hotel in Seoul last Friday, December 1. Jung’s family who also owns RAKSO Holdings Co. Ltd. is handling exclusively PAL’s business operations in Korea. Mr. Jung discussed with Chatto and PAL officials from Manila the aggressive promotions for Bohol and the island’s tourist attractions thru filming. Plans are underway also to connect Tagbilaran-Busan, Korea; the country’s second largest City next to Seoul when aircraft and schedules availability will be addressed in both Tagbilaran and Busan Airports. It is expected that more international & domestic flights to Bohol will open once the New Bohol-Panglao International Airport will be finished in June 2018 and commercial flights to start in August. PAL Korea can provide incentives to filmmakers and Bohol can assist thru the Province’s Film Development Program signed by Governor Chatto and Film Development Center Dir. Liza Dino recently. To date, 62 PAL flights connect KOREA-PHILS, including Tagbilaran, Bohol. Gov. Chatto echoed the recommendations of Bohol Tourism players to the Department of Tourism (DOT) that more promotions budget should be focused on neighboring Asian countries like Korea. “They are not much affected by negative news in Southern Philippines because of better understanding of the Philippine geography and culture compared to tourists from the western continents,” Chatto added.